Nut face angularity influences the fatigue life of the bolt. Angularity or lack of, dramatically reduces the bolt's fatigue life. Bolt Science shows that at 2% angularity (at the edge of allowed limit for a common AN nut) can reduce the bolt's fatigue life from 180,000 fatigue cycles to just 10,000 fatigue cycles! Nut face surface influences how much embedment relaxation (joint loosening) occurs after you stop torquing the joint. The surfaces squish together slightly resulting in a loss of joint tension. An example of this is the crushed washer below. As the washer surface compresses, the joint becomes loose even though it was properly torqued to begin with. Now take a look at the nuts below. The malformed washer faces can crush just like the washer and result in a loose joint. 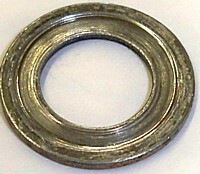 Compare the contact area of a normal washer face on the left with this malformed washer face on the right. The malformed face concentrates the tension onto a small ring which is more likely going to gouge and crush into the contact surface. 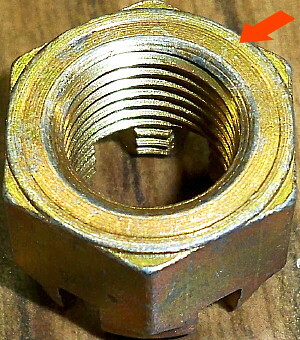 The malformed nuts shown here reduce the joint integrity which may lead to joint failure, which in the aircraft industry is often catastrophic. As I have observed over the years, if the joint fails due to loosening, it will be assumed without any further investigation that the mechanic didn't tighten the joint properly. example, YOU will be blamed. 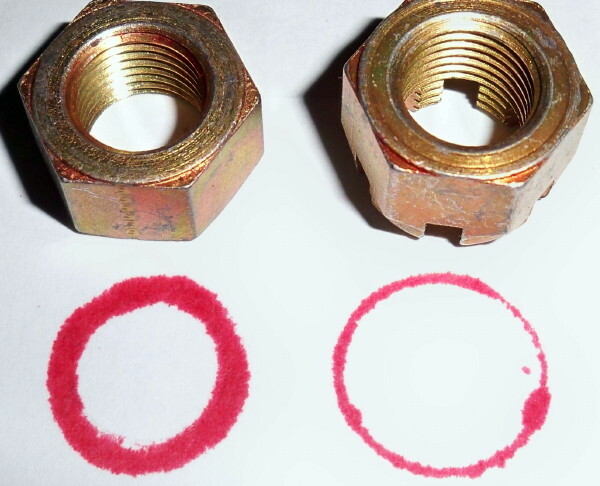 A quick inspection of surfaces: bolt, nut, faying, washers, is recommended before assembly. and while I am giving recommendations, torque specifications that specify the application of lubricant are defective if they do not also include where to apply the lubricant. 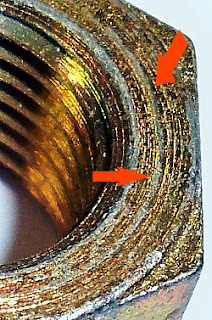 Since the seating surfaces represents 50% of the friction during tightening, it's important to know if the engineer intended that these surfaces, and the thread surfaces, be lubricated. The practice varies among engineer's so there is know way of knowing if the specification doesn't state. 1. Thread and Under - Head Friction by Dr. Michael P. Oliver. 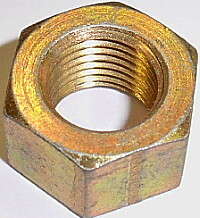 "..there are the two contact areas when a bolt is used to create a joint with the aid of a nut. The two areas are the under-head of the bolt (provided it is the bolt that is rotating) and in the threads between the nut and the bolt."